Is it by your weight, your blood pressure, your cholesterol profile, or maybe all of them? According to Dr. Brian Lenzkes, there’s one critical health marker you should pay attention to (but probably don’t): insulin sensitivity. Dr. Lenzkes is an internal medicine doctor who focuses on clinical nutrition and helps his patients through lifestyle and nutrition changes. He also happens to be one of today’s guests. Brian believes mainstream nutrition advice has made people so worried about fat and cholesterol that they don’t pay attention to the damage carbs do to their body. Insulin resistance — what happens when you lose insulin sensitivity — is a direct result of eating too many carbs and too many meals per day, and it’s a precursor for diabetes and heart disease. However, most people don’t know they have it until it’s too late. The CDC director admits that over a third of U.S. adults have prediabetes (which involves insulin resistance), and most of them have no idea. The worst part is, by the time you’re insulin resistant, it’s harder to turn your metabolism back to normal. Today Dr. Lenzkes explains why insulin sensitivity matters and how you can optimize yours with a ketogenic diet or a low carb approach. Today’s episode is extra special because we have a double feature! Rachel Gregory is also my guest and she will explain how a ketogenic diet can give you an edge at the gym and radically improve your post-workout recovery. Rachel is a board-certified nutrition specialist and athletic trainer. She made a giant contribution to the scientific community and keto space by publishing the first ever human clinical trial about the effects of the ketogenic diet on CrossFit athletes. She’s seen first hand the positive effects a low carb diet has over metabolic flexibility. 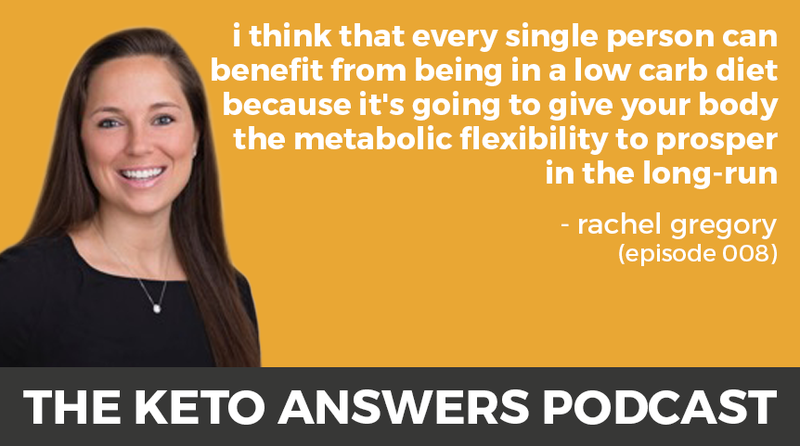 Let’s just say that if you care about building strength and losing fat, you’ll love what Rachel has to say about keto and performance.